Share "Guide to Wedding Rentals"
Weddings can be a real hassle to plan and execute. You have to send invitations, book venues, and you’re constantly making changes to adapt or plan for the unexpected. The best way to overcome the odds and please the crowd is to rent the equipment and items you need to pull it off. Renting offers you flexibility, endless options, and saves you money. 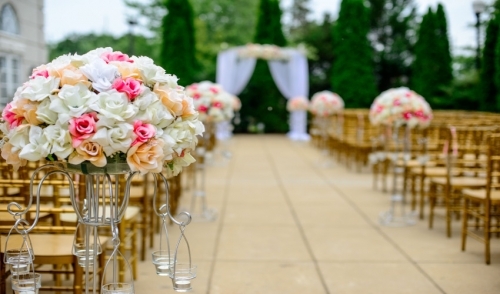 Don’t be overly concerned with renting until you have decided on a wedding venue. Some venues offer extensions and options that can help you sort out the details of the items you will need for your wedding guests. Certain venues can provide, dinnerware, furniture, and glassware all included into one large price. However, if you are working with a raw space or having an outdoor wedding, get ready to rent everything down to the last fork. Follow this article for all the tips you need to pull off your dream wedding. Before renting, talk to your wedding team for any referrals on where to get what. Your wedding team is your caterer, floral designer, venue manager, wedding planner, and anyone else that is vital to the success of your wedding. Referrals go a long way and can help you secure a deal on the items you need. Once you figure out where to rent, make sure to ask the essential questions regarding deposits, licenses and insurance, delivery, and cancellation policies. These are all very important questions to ask before making a deal and signing on a dotted line. After everything is in order, now it’s time to make a decision on what to rent. Start with renting tables, chairs, and linens. Tables for your guest are likely to be square, round, or long rectangle. Long rectangle chairs are currently trendy, but require more centerpieces and flower arrangements. Round tables are considered to be the most budget friendly across most rental dealers. After you have discovered your table layout, now it’s time to pick the chairs. Chairs are the thing that really pull the room together. You may need chairs for the ceremony, cocktail party, and reception, so don’t be afraid to live a little. Vintage arm chairs or chiavari chairs are currently popular and there are plenty of variations and options to choose from to meet your needs. Depending on the tables you chose, you will need to get linens and tablecloths that will match if you opted for the long rectangle, I recommend using runners. If you’re venue is outdoors, then you also might want to look into renting table cloth rings to help hold everything down. Once your foundation is set, make sure to rent the proper stem and glassware. Consider renting various glasses and utensils for your guest to eat and drink off of. The rule of thumb is at least 3 sets of glassware per guest. The next tip is to rent furniture and lighting for the event. Couches, ottomans, and other furniture arrangements should be rented for your guest to relax and enjoy the wedding. Depending on the venue, you may also want to rent extra lighting to better illuminate the venue at night. Make sure to talk to your rental dealer about additional costs for professional installation. If the wedding is outdoors, tents are also a must to rent. Tents go fast so be sure to make the judgement call early in your planning process. Finally, rent everything else you need to make the wedding fun. Some fun items to rent include a photo booth, games, eclectic décor, and heating/cooling to provide an experience all of your guest will remember. Weddings are worth all the money and hassle you put into it. To get more value out of your wedding, follow this guide to wedding rentals.